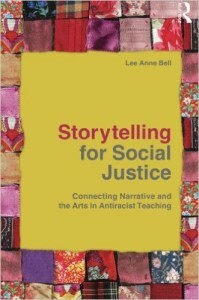 Summary: This article by Art Peterson describes how Lee Anne Bell, author of Storytelling for Social Justice, explores the tension between stock stories and counter or concealed stories in order to develop an anti-racist pedagogy. As Peterson notes, “Bell’s purpose is not only to expose the myths that support the stock story, but also to help those she works with create what she calls transformative stories. . . stories [that] ‘imagine alternative scenarios for racial equality and articulate strategies to work toward these visions. '” Resources attached to this article include a link to Bell’s Storytelling Project Curriculum and may be most useful in planning and designing professional development related to issues of equity and social justice. Lee Anne Bell, a professor and director of education at Barnard College, Columbia University, knows ways to attack the racial inequalities that remain prevalent in American society and schools. She details many of these solutions in her book Storytelling for Social Justice: Connecting Narrative and the Arts in Antiracist Teaching. Her optimism, however, is tempered by a caveat: achieving this transformation will be hard work. Bell, who will be the keynote speaker at this spring’s Rural Sites Network Conference in Little Rock, Arkansas, March 11–12, has devoted her career to the challenging task of taking on social justice issues and will share her insights with attendees. Bell’s interest in social justice was sparked by a college course she took on African American history that exposed her to a historical narrative she had never known existed. She added a second major in African American studies to her history major as a result. Unfortunately, the culture transmitted by the stock story too often works to reinforce the racist status quo. We tell each other, for instance, “I don’t see color; I see people.” Bell calls this profession of color-blindness a “sincere fiction” and provides examples to challenge its veracity, including some drawn from her own experience. To counter this distorted thinking, Bell introduces the counter story or concealed story as a way of challenging the stock story. One technique is to use the evidence of history to counter the stock story. For example, when we learn that between 1934 and 1962 the federal government backed $120 billion in home loans but that 98 percent of these went to white people, we begin to see the systemic inequalities built into the system. Bell also finds ways to use the experiences of the students and teachers she works with to deflate the stock story. She asks participants to line up and then step aside if, for instance, they have ever been followed around a department store by an employee, or neglected to call the police out of fear of a negative interaction with law enforcement. Inevitably, the white people in the group are most likely to stay put. To this end Bell relies on the arsenal of activities she has helped develop for the Storytelling Project curriculum, which teaches about race, racism, and social justice using storytelling and the arts. Bell has used this curriculum, which focuses on active learning and draws significantly on poetry, drama, dance, theater games, and collage, in the New York City schools and in workshops with teachers. In one activity she asks participants to bring a physical object that represents race in their lives. “They bring photos, books, art, poetry, items of clothing, jewelry, and more,” she says. The items are then grouped to form a collection that is the basis of a story about the meaning and significance of the collection. Another reason Bell’s Little Rock appearance will be of special interest to rural teachers is the relevance of her current project, a documentary film called Forty Years Later: Now Can We Talk? This film brings together black and white alumni from the first integrated class at their high school in the Mississippi Delta. In the film, alumni recall their memories of this tumultuous period, explore their contrasting experiences across the color line, and consider the impacts on their lives today. Bell recently received a grant from the Kellogg Foundation to support the continuing work on the film and its companion teacher guide. The film will be an extension of Bell’s ongoing efforts to help teachers and students leave stock stories behind and create those transformative experiences that will lead to a more just society. She hopes her appearance at the Rural Sites meeting will give her audience new tools to help their students build transforming stories.